Somehow I never heard about this series or author until coming across the giveaway for this book, and I am fortunate to have won it, one of the more enjoyable fantasy novels I’ve read in some time. With any fantasy, world-building has prime importance, as any other element of fiction will be easily ruined by a crumbling facade of suspended disbelief or grow dull in a clichéd, familiar setting. From the opening chapter, Brett’s world of pre-tech (or is it post-tech), demon-plagued night is fascinating. With characters in relative ignorance of the world they inhabit beyond the pressing immediacy of the daily struggle to survive, Brett is able to reveal the world of his series gradually, enticing the reader’s interest, supplying bits of satisfaction, and leaving the tease of deeper revelations still-to-come. Yet nowhere does one feel shortchanged or played with. Brett’s construction of this world shows that he is simply a masterful storyteller with a love and appreciation for fantasy at its simplest. The novel’s apparent simplicity as entertaining story and comments by others regarding the black/white good/bad dichotomy made me somewhat wary when starting the novel, afraid things would be a little too simplistic. With those expectations I actually was pleasingly surprised to see that the plot did not unfold in the manner I expected, the journey of each of the series’ protagonists did not go straight from A to B without mis-step. Too often in fantasy novels the heroes are presented with challenge after challenger, yet surpass each without any actual deviation from the original intentions, from the original set-up. In meaningful ways, Brett does take the story and his characters in unexpected directions or excursions, even if their broad, ultimate destiny is clear. Through this all, Brett makes the reader care deeply for each of the three main characters, and enjoy the presence of the various secondary characters, good and bad, who cross their path. 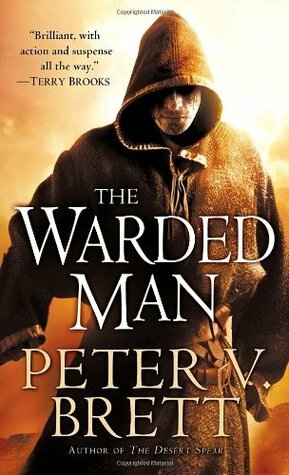 Of the trio, Arlen (the Warded Man) is featured the most, and for all of the novel I grew increasingly concerned that he was being made into far too powerful of a hero, a cartoonish superhero that could not fail. While others were in danger, including those he cares about, one never doubts that Arlen won’t be able to face any demon coming out with no more than a mild scratch. However, this is balanced nicely by the vulnerability of the other protagonists, and the novel begins to develop (and hint for further developments) in the true weaknesses of Arlen, not physical, but spiritual, a loss of humanity. This was a surprisingly satisfying read and I’m eager to read the remainder of the series, always the drawback to finding a fantasy novel that captures the imagination.